If you’ve ever dreamed of soaring through the air alongside a dragon, the iFly indoor skydiving simulators are now offering the next best thing in the form of a How To Train Your Dragon VR experience inspired by the upcoming sequel, The Hidden World. Take a simulated flight alongside Toothless in the new How To Train Your Dragon VR experience at iFly indoor skydiving locations around the world. iFly locations around the globe, including the dual-tunnel Orlando facility (but excluding Jacksonville, FL) are now offering virtual reality add-ons to their indoor skydiving packages that allow guests to spread their wings above the mythical Viking kingdom of Berk. Riders can choose to fly with either Hiccup or Astrid, and don VR headsets to soar like a dragon alongside Toothless, while being guided by instructors through their journey. DreamWorks Animation and iFLY teamed up to create the How to Train Your Dragon VR experience, combining state-of-the-art VR equipment with iFly’s patented wind tunnel technology, which lets riders float atop a rush of air. VR is available for flyers ages 6 to 70 years old, and up to 260 lbs. Participants ages under 12 are limited to one 1 VR flight per day, and individuals with heart conditions cannot fly VR. 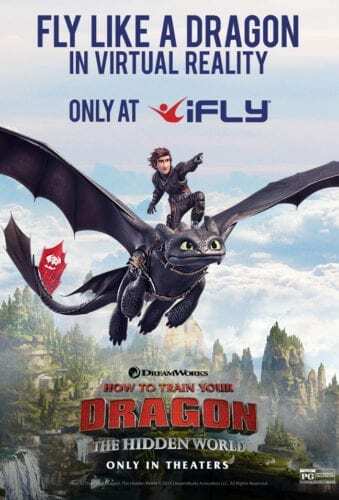 A package combining two iFly training flights and one How To Train Your Dragon VR flight, along with all equipment and instruction, starts at $99. For a limited time, repeat riders can add the virtual reality on to a multi-flight purchase for $9.95.